"John, your life is before you. Fill these pages with kind acts, good thoughts, and matters of your heart. Write a great story with your life." This 'book' motivated John to begin writing his own life story and it changed his life. As we begin 2017, God has given us all the gift of a book with 365 blank pages. Through his Spirit God is urging us to write our story and to honour the life he has given us. So, the hard question is this: "What will we write on these blank pages?" 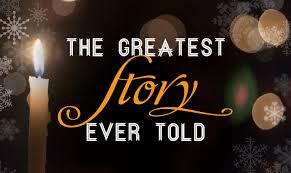 Of course, we get to write our story in the shadow of the GREATEST STORY EVER TOLD, which is the story of Jesus. To "Behold" something is to see it, or take notice of it, or let it sink deeply into our souls. It is not just catching a fleeting glimpse of something, but allowing it to impact our world. 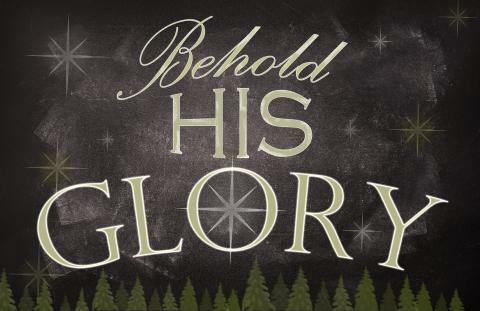 I invite us all to "BEHOLD" the Messiah this Christmas season and to allow Jesus to impact our lives. May the Grace of Jesus fill you to overflowing this year and may you have a Blessed Christmas.  Matthew 1:23 - Behold, a virgin shall be with child, and shall bring forth a son, and they shall call his name Emmanuel, which being interpreted is, God with us. 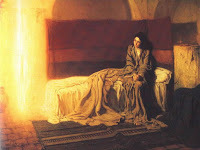 "Mary said,“With all my heart I glorify the Lord! 47 In the depths of who I am I rejoice in God my saviour. 48 He has looked with favour on the low status of his servant. 49 because the mighty one has done great things for me. Christmas has the potential to impact the "very depths of our being", if we will allow Christ to change us. Who we are can be completely redefined by the message of Christmas. Will you allow Jesus into the depths of your heart this year? Let us spend more time preparing our hearts for Christmas than we spend in buying all our goodies and food for the celebration. God is ... ABLE to do more than we could ever dream of or even imagine. God is miraculous, generous, powerful and yet gracious. 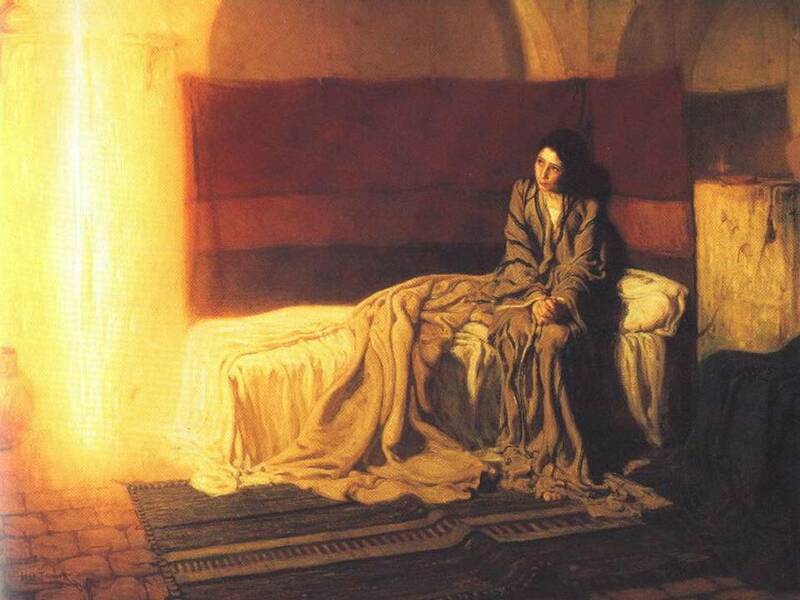 In this season of Advent, let us not forget that the God we worship is Able to confound all human logic. Daniel 3:17 - If we are thrown into the blazing furnace, the God whom we serve is able to save us. He will rescue us from your power, Your Majesty. 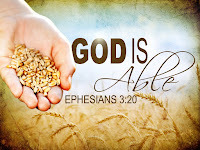 Romans 4:21 - If we are thrown into the blazing furnace, the God whom we serve is able to save us. He will rescue us from your power, Your Majesty. Lamentations 3:28-30 - When life is heavy and hard to take, go off by yourself. 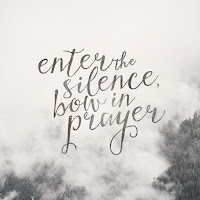 Enter the silence. 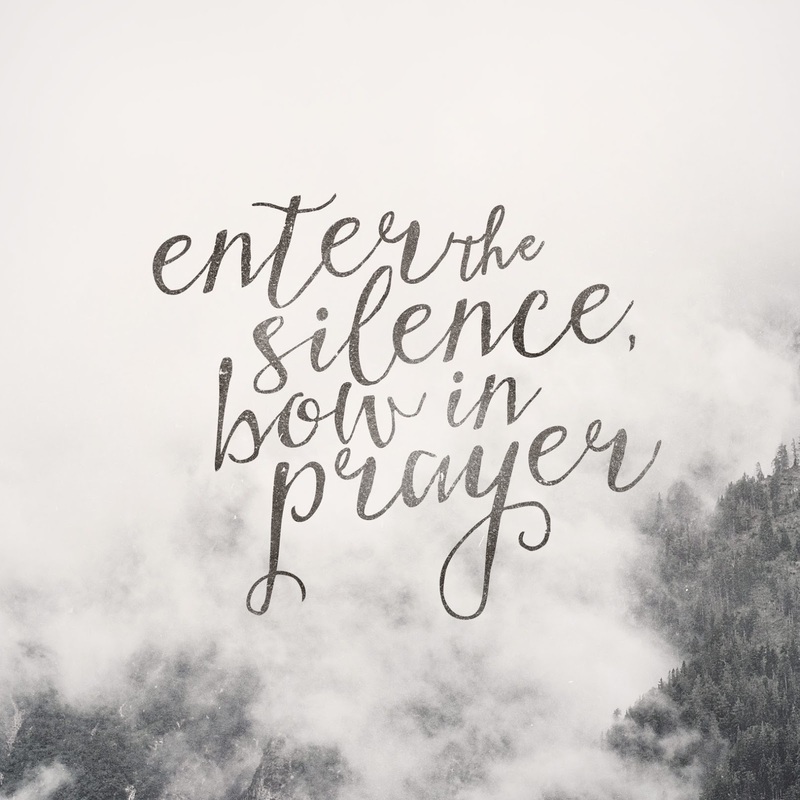 Bow in prayer. Don’t ask questions: Wait for hope to appear. Don’t run from trouble. Take it full-face. The “worst” is never the worst (Message). With Christ we can face trouble face on, because the worst is 'never' the worst. Have a blessed Advent Day. 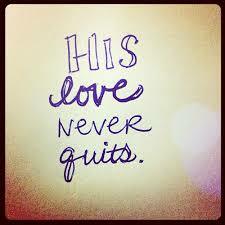 Thank you Lord for never giving up on us. 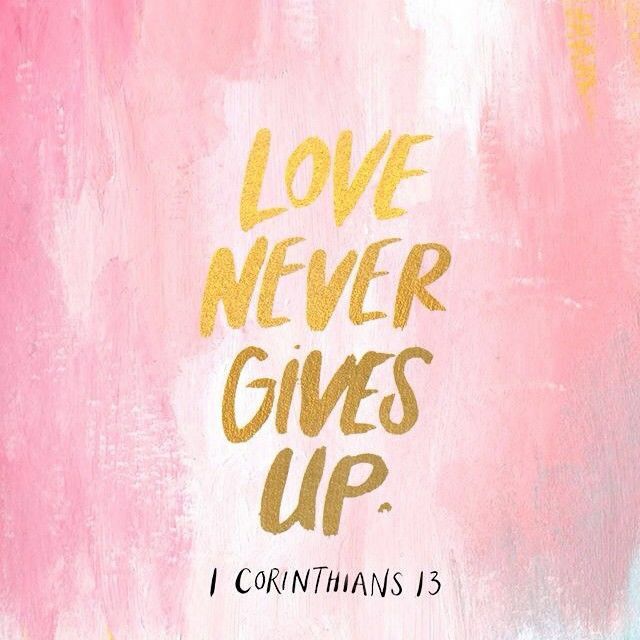 LOVE never gives up! 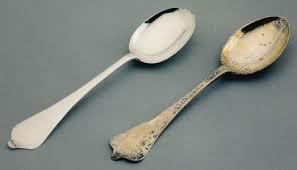 God loves us even when the shine wears off. Human love can be fraught with imperfection and disappointment. The 'honeymoon' period never lasts forever and people are left wondering who blew the candles out! Yet, Love is always about a CHOICE and never a feeling. Choosing to remain faithful to God, a spouse, a prodigal child, is all about a decision - yes, a hard decision, but one we can make. Thank you Lord that you refused to 'jump ship' even when humanity turned our backs on you. God's love never Quits! God pours out the abundance of his love for us every day. 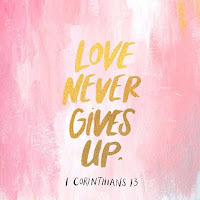 When all kinds of things around us stop working and quit on us, God's love never does. Advent is not a time when we welcome the love of God and then wave goodbye to that love - No ways. God's FAITHFUL love endures forever. Many of us are running around, trying to beat the mad shopping rush at the moment. We are looking for the right gifts for our loved ones and friends. But, what if you could choose to give your family a gift that was not a monetary one? Think about that for a moment - what would you choose for each one of those special people in your lives? 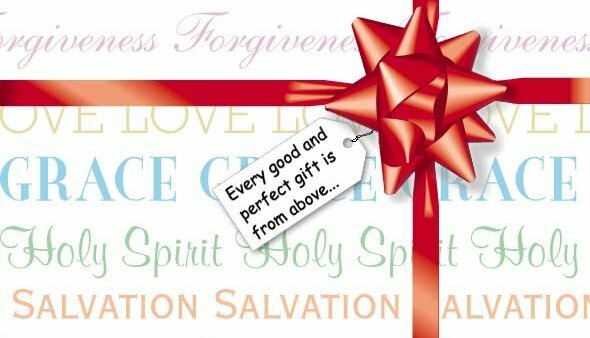 Matthew 7:11 - If you, then, though you are evil, know how to give good gifts to your children, how much more will your Father in heaven give good gifts to those who ask him! 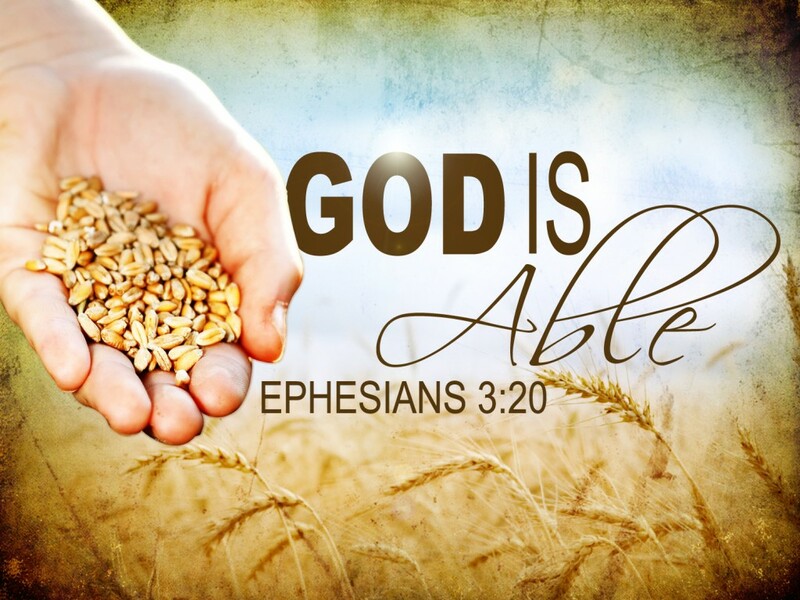 2 Corinthians 9:15 -Thanks be to God for his indescribable gift! Thank God that he doesn't give us what we want, but actually what we NEED!